I have officially joined the wheatgrass growing club! Anthony of RawModel.com had done a post a while ago about growing wheatgrass using ocean minerals that inspired me to get my own grass growing. While you can certainly get a good crop of greens without the extras there is always room for more minerals. It’s why we drink the greens right? So I had a look around to see if there was anything like the ocean minerals available in New Zealand and I came across this little website from Palmerston North, my home town! It’s run by a man named Wally and while he’s no web designer he certainly has the green thumb and some good tips for growing wheatgrass. So I ordered some of Wally’s Ocean Solids and a manual juicer to get my lawn underway. What’s cool about the wheatgrass and ocean solids combo is that there are over 90 different minerals in the ocean solids and wheatgrass can absorb pretty much all of them. Just think of all those minerals in that one little glass of green goodness. Oh my! You just add some of the ocean solids, which look like rock salt, to your water that you’re going to water your crops with. You can also add a little bit to the soil. 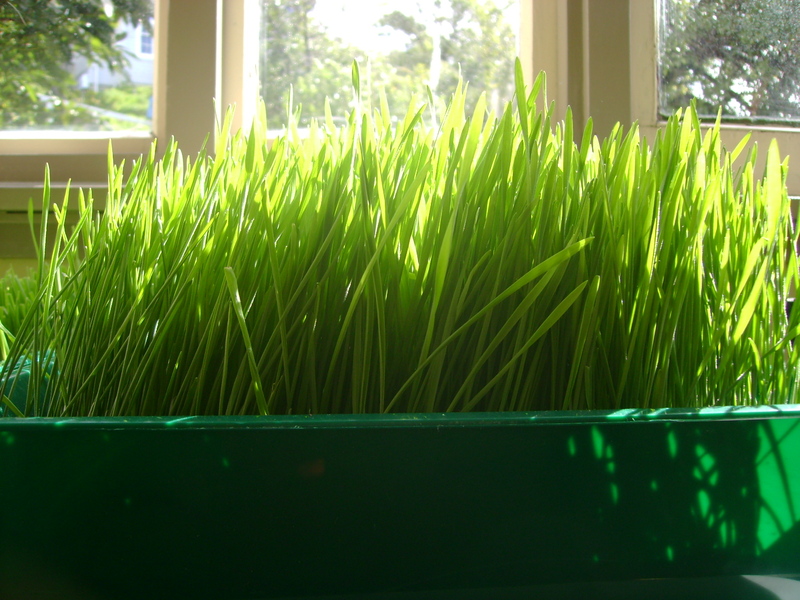 If you’ve ever seen the trays of wheatgrass growing on the counter at a juicebar you’ll know it’s familiar green colour. But when you grow with the ocean solids, the grass is absorbing so many minerals which gives the grass an almost blue-green colour. It just looks so much healthier than other kinds I have seen. It’s sweeter and fresher than the juicebar variety and saves you your three dollars a shot you might spend if you bought out. I’m hooked. 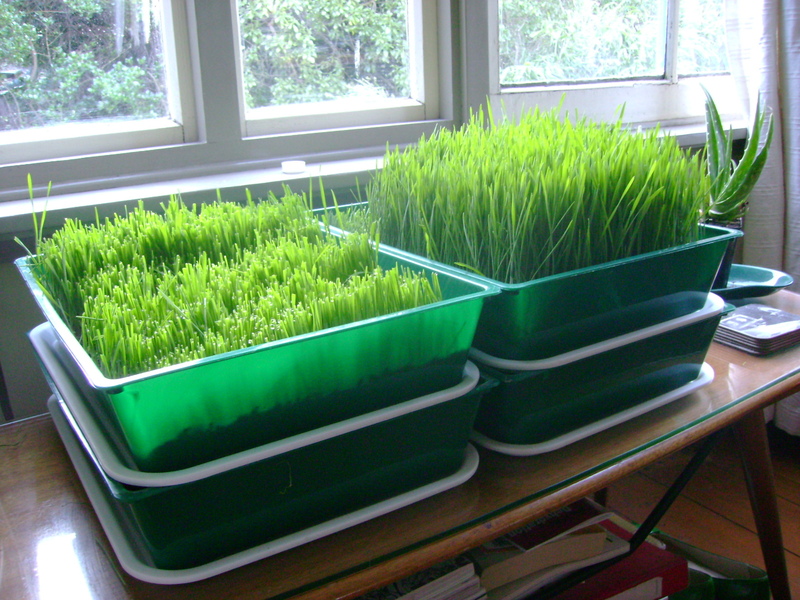 I honestly don’t know what took me so long to get my homegrown wheatgrass setup. It’s so easy to grow and it looks great. So you can see in the photo, I have 4 trays. I have already mowed the lawn on the left. The lawn on the right is good to go. The two underneath are full of wheat that is still in the mid-sprouting stage. When the wheat gets longer shoots I will rotate them up to the top to catch the sunlight and turn it into chlorophyll for me to drink! For anyone reading that doesn’t know about the miracle of wheatgrass and why you would drink something that tastes like you just mowed the lawn here are 40 reasons to drink wheatgrass. 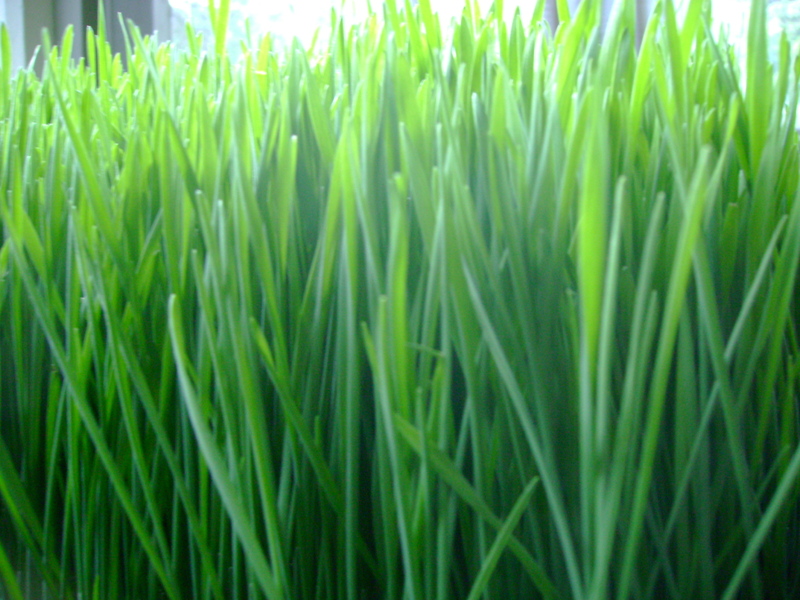 Also, Karen Knowler has a good video about growing wheatgrass here. Hi Amanda. 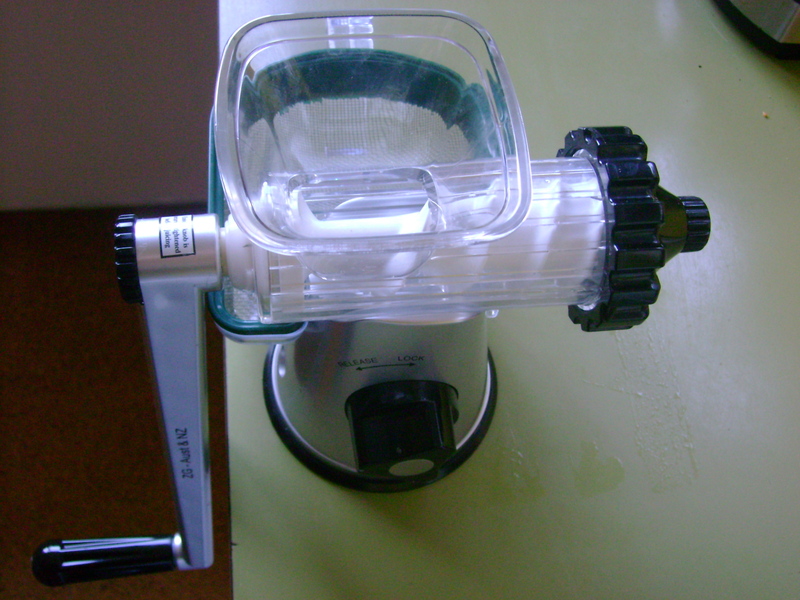 I bought my manual juicer and ocean solids from Wally at Garden News You can get a kit or just buy the juicer on it’s own. The trays are just kitty litter trays that I banged some holes in. You can get them at Plastic Box or New World or probably a pet store. Happy juicing!